Government investment in science requires strategic vision and clear information so that it can ensure the UK is investing in the right areas. Our report is accompanied by an Evaluative Framework to guide effective cross-government coordination. Government needs a coherent view of the UK’s research strengths relative to other nations and an analysis of funding in key areas of research, so that it can prioritise areas where activity is lagging behind and ensure the UK is investing in the right areas, according to today’s report from the National Audit Office. In 2015, total UK government expenditure on research and development was £8.75 billion. In 2016, the Government announced that it would provide an additional £4.7 billion of research and development funding by 2021. The Department for Business, Energy & Industrial Strategy (BEIS) has responsibility for the majority of government spending on science. However, around a third of public funding comes from other government departments. This cross-government investment in science requires strategic vision and clear information about how funding is used. Today’s report finds that there is a risk that funders do not have coherent data across research areas on capability, funding gaps, or outcomes of research and development to inform decisions on national priorities and strategic direction. While some of the more mature areas of research the NAO examined, such as human health research, have well-established arrangements to support co-ordination and collaboration between public sector funders, the NAO found that some important areas of science need more effective leadership. Despite consensus that it is needed, government has not yet established leadership and a strategy for investing in robotics. Government has also faced challenges in establishing stable leadership in advanced materials research. Where there is effective leadership, funders work together to prioritise research investment. 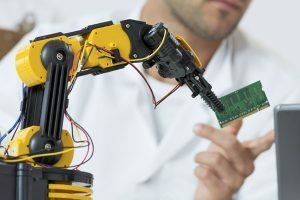 However, collective action is needed to prioritise investment in the three research areas the NAO examined (climate research, robotics and autonomous systems, and advanced materials) to ensure efforts are focused on addressing the principal challenges. The report finds that most research areas the NAO examined lacked coherent and complete information on funding of research, skills and infrastructure. Many examined also lacked consolidated analysis of the impact of research and development. The UK’s withdrawal from the European Union could affect how UK research is funded in future. The UK is a net receiver of competitive EU funding for research. Between 2007 and 2013, the UK contributed 5.4 billion euros and received 8.8 billion euros. The UK needs good information on funding, skills and infrastructure to establish which research programmes and facilities are potentially affected by the UK leaving the EU to inform future priorities for UK investment in science. Among the NAO’s recommendations is that the UK Research & Innovation (the new organisation which will be in place from April 2018 to create an integrated research and innovation system) and BEIS should begin work with other government departments and the Government Office for Science to identify the areas of research that need strategic leadership and co-ordination. The NAO has separately published an evaluative framework to help funders assess and develop leadership arrangements in their areas of research.